I love pasta. I love bread. The two together are a perfect pair, and obviously carb over-load. So it took me by surprise when I came across this recipe at RhodesBread.com for baking spaghetti inside a bread braid. I had to try it right away, so about 2 days after spotting the recipe, I made this. Now, I must warn you I've never made any sort of bread braid before, so I do need some practice with that. But after making this and having my daughter actually eat her entire dinner I will be making this again! The only big change I made was that I used spiral pasta noodles, and I just enjoy them more than spaghetti noodles :) I also made this recipe with 2 loaves of bread, as I knew one wouldn't enough to feed my husband (he eats a lot) as well as have some for his lunch the following day. I believe 2 loaves would better feed a family of 4 rather than just one. But break this recipe in half if you wish. Thaw dough out according to package directions. Bring water to a boil in a large stock pot. While water is coming to a boil, roll out each dough loaf onto a lightly floured surface. Create as much as a rectangle as possible. 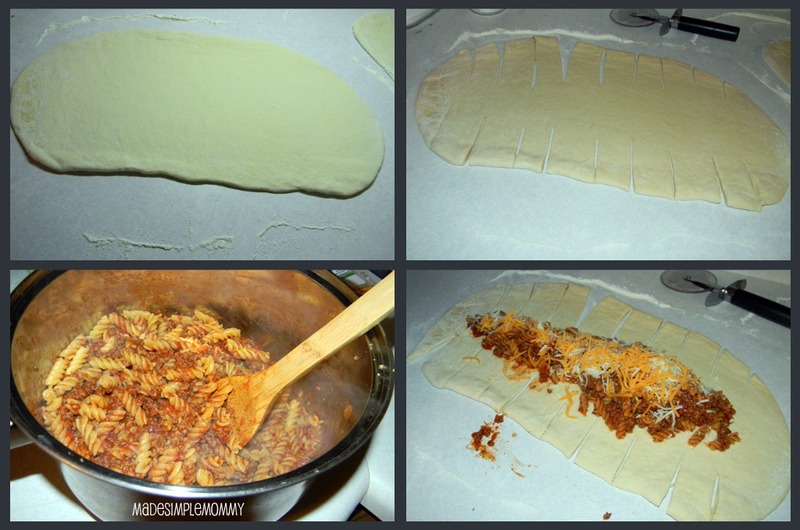 Cut slits into each long side of the dough so you may create a braid. Brown beef in skillet on the stove. Add seasonings to taste; add spaghetti sauce. Let simmer until pasta is done to your likeness. Drain pasta; combine with spaghetti sauce mixture. Spoon into center of each braid. Braid the dough; left-right, right-left, left-right, etc. Brush tops of dough with egg white. Sprinkle with Parmesan and parsley flakes. Bake for 35-40 minutes or until dough is a nice golden brown. Remove from oven; let set a few minutes, then slice and enjoy!